Undermount sink with drain board is a compact sink that has sufficient depth to contain and offer a washing platform for used kitchen wares at one go. The drain board is designed to restrict the water from spilling on the floor or on the slab where it is fitted. 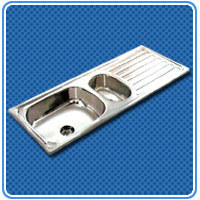 Our products are available in various designs. Our products speak for us…PRINCE…the one stop name for all kitchen accessories….an experience that goes beyond 23 years …south India's number 1 sink manufacturer and exporter….the "Prince charming" you've all been waiting for!!! All that's really worth doing, is what we do for others", and here, at PRINCE, India's most reliable sink brand, that is exactly what we do! With uncompromising quality and boundless innovative drive, our commitment is to our customers out there, because to us, IT IS ALL ABOUT YOU! And our ongoing success is highly dependent on our loyal customer base and continued addition of new and satisfied customers.